More than thirty years have passed since the first and until now the only comprehensive treatment of this subject by Helmut Rüfer and Wolf Rungas. During this time much new information has come to light and not a few errors have been recognised in this work, many due to the lack of knowledge of the Japanese script on the part of Rüfer and Rungas. Moreover the publication of that book seems to have been unduly hurried and issued with insufficient regard to the breadth of the subject matter. Our member Ludwig Seitz attempts to remedy these shortcomings. The author spent some time during World War II in Japan where he acquired some knowledge of Japanese which even enabled him to interpret the complicated script in the Han, the ’chops’ of the censors. He deals with the subject in great detail, his knowledge backed not only by his own comprehensive collection, but by an index built up over more than forty years, which contains copies and information from other important collections as well as from German and foreign auction catalogues. The text is greatly enhanced by the presence of over 1,400 illustrations, representations of nearly all known postmarks and seals including those of the post, the censors, the camps themselves and others as well as of various forms and registration labels. A large number of the many attractive postcards produced by the camp print shops are also pictured. and explains how such mail can be recognised. An index of the Tsingtau units and administrative offices is included. 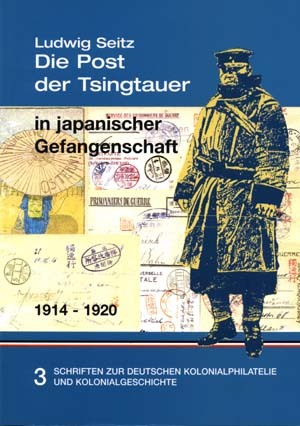 Other chapters deal with the organisations set up to help prisoners of war, the Central Search Bureau of the German Admiralty and its Japanese sub-office, the Information Bureau in Tokyo, postal traffic with the Germans left behind in Tsingtau and with Germans in non-Japanese camps (Torpedoboat ’S 90’ and auxiliary cruiser (’Cormoran’); also post from the transports which were taking returning prisoners back to Germany in 1920. A short section deals with Japanese prisoners in German hands. Finally at the end of this general chapter there is to be found a guide to pricing. The second part of the book deals with the individual camps arranged according to a system explained in an introduction. For each camp the same order is then followed for the listing of all the appertaining postmarks, the postal stationery, any special forms and picture postcards. Everything is also illustrated. Each of the 18 camps which housed German and Austrian prisoners of war (from the ‘Kaiserin Elisabeth’) has a separate section devoted to it. A map is attached which shows where in Japan the individual camps were situated.